What do you know about the man known as JESUS CHRIST? Many claim to know him but actually only know OF him. They know of his works, the know he was the "Son of God" but that's about it. "The name Jesus means "God Saves." The Term Christ is a title for "Anointed of God." For MUSLIMS and some JEWS, Jesus was a Prophet. Buddhists say he was enlightened. 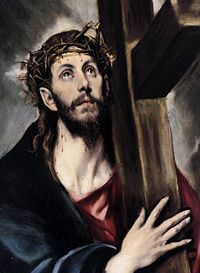 Hindus call him an Avatar (The incarnation of a deity in human form) and Christians hail him as the SON OF GOD. Although he is understood in many different ways, Everyone seems to agree that he was an Extraordinary Man." Jesus' life is chronicled in the various translations of THE HOLY BIBLE. Four Gospels of the New Testament give account of Jesus' life and activities, but only two trace back his Genealogy. There is a difference between the two, and there are many theories as to why. The similarities include tracing his ancestors back to Abraham of the Old Testament, and through King David. The big difference is that The Gospel of Matthew traces Jesus through all the Kings of Israel, thus showing that Jesus was the rightful King of Israel, however Luke's Genealogy is much longer and traces Jesus all the way back to Adam, the first man. Both Luke and Matthew tell of Jesus' birth and early childhood. According to their books, Jesus was born in Bethlehem of Judea to Mary, a virgin at the time of conception through the Holy Spirit. Upon hearing of her pregnancy, her husband-to-be, a Carpenter by the name of Joseph, wanted to quietly separate from her. An angel appeared to Joseph in a dream and explained that the infant would be named Jesus, and was the Son of God. The angel also explained that Mary was a virgin and had been faithful to Joseph. Upon learning of the birth of a new "King of the Jews" King Harold ordered the murder of all boys born in the area. Joseph and Mary were warned however by an angel and escaped to Egypt until Harold's Death. Luke tells a story of Jesus being lost and Mary finding him preaching in a temple to priests as a young child. This is the only story of Jesus as a child until his baptism at about 30 years of age. It has been suggested that since his "father", Joseph, was a Carpenter by trade, that Jesus spent this time learning the skills of carpentry. JESUS' BAPTISM AND EARLY MINSTRY. Covered in the four Gospels of MARK, LUKE, MATTHEW, And JOHN, as well as the book of ACTS, Jesus' Early ministry was spent mostly preaching and establishing his following. The Gospels describe the beginning of Jesus' public ministry as starting with his Baptism at the River Jordan by John the Baptist. Matthew describes Jesus showing up at the Jordan River where John the Baptist was preaching and baptizing the masses. He also tells of John being hesitant to baptize Jesus because he knew that Jesus was the Son of God, and felt that Jesus should be Anointing him. Jesus persisted, "It is proper for us to do this to fulfill all righteousness" (Matthew 3:15). After his Baptism, Mark tells that Jesus saw the heavens part and the Holy Spirit descended on him like a dove. He also tells of A voice from the Heavens that proclaims that Jesus is the LORD'S beloved son and that GOD is "well pleased." The Gospel of JOHN does not tell of the baptism but does say that John the Baptist knew that Jesus was the Son of God. After being baptized, The LORD led Jesus to the Desert where he fasted for forty days and forty nights. During this time, The Devil attempted to get Jesus to abuse his abilities for his own gain. He did this by appealing to Jesus' human side. First he tempted his hunger and ego. Knowing Jesus had been fasting, the Devil told him to turn Stone into bread to prove that he really was the Son of God, Jesus replied back with scripture saying "People do not live by bread alone, but by every word from the mouth of God." Jesus did not succumb to the temptation. When the Devil departed, angels appeared and gave Jesus nourishment. The second temptation took place in the Holy City of Jerusalem atop the highest temple in the city. The Devil again tried to make Jesus prove that he was the Son of God by Jumping, this time quoting scripture and telling him that Angels should save him. Jesus responded with scripture saying that it is not right to test The LORD. The Third Temptation of Christ took place on a very high mountain where the Devil Promised to give Jesus all the land he could see if he only bow down to him. Jesus dismissed him saying "You must worship only The LORD and Serve only him". The Devil left, and again angels came and took care of Jesus. The Gospels tell that Jesus came to earth as the "Lamb of God" meaning his life was to be sacrificed to atone for the sins of his followers and allow them passage into heaven when they died. Before Jesus, Jews had to sacrifice a perfect lamb and eat it to atone for sins, hence Jesus as the Lamb of God. Jesus said that access to the Father (God) was only gained through him. The Gospels also indicate that Jesus was GOD in the flesh. During the course of his ministry, Jesus preformed many miracles including walking on water, turning water into wine, turning one fish and loaf of bread into enough to feed hundreds, bringing people back from the dead, curing the sick and many exorcisms. Jesus even exercised power over the elements on occasion. Often, people would travel hundreds of miles, on foot, and stand for hours just to hear Jesus preach. The sick were healed by Jesus' touch and on one occasion (MATTHEW 8:5-13) Jesus healed an ARMY officer's family member simply by saying that they were healed, and never actually seeing them. Jesus' main followers were Twelve hand chosen men called his Apostles. By name, they were: Simon, whom Jesus named Peter, a fisherman from Bethsaida "of Galilee"; James, son of Zebedee; John the brother of James: Jesus named both of them Boanerges, which means "sons of thunder"; Andrew, the brother of Simon Peter, a Bethsaida fisherman, and a former disciple of John the Baptist; Philip from Bethsaida of Galilee; Bartholomew, son of Talemai. Bartholomew may have been the same person as Nathanael, who is mentioned in John 1:45-1:51. Matthew, the tax collector, who was known as "Levi", son of Alphaeus; Thomas, also known as Judas Thomas Didymus; James the son of Alphaeus, James was often called "James the Less", and identified by Catholics with "James the Just"; Thaddeus: The identity of this apostle, who has traditionally been called St. Jude, varies between the Gospels and also between ancient manuscripts of each gospel: Mark names him as Thaddaeus, different manuscripts of Matthew identify him as either Thaddeus or "Lebbaeus". Luke names him as Judas, son of James. Many presumed that all these names refer to the same person; Simon the Cananean, named in Luke and Acts as "Simon the Zealot"; and finally Judas Iscariot: the disciple who later betrayed Jesus. Judas Iscariot is also referred to (John 6:71 and 13:26) as "Judas, the son of Simon". He was replaced as an apostle shortly after Jesus' resurrection by Matthias. Jesus made his Apostles "Fishers of Men" and in recruiting them, all he had to do was ask, and they followed him. Later, many did miracles in Jesus' name. 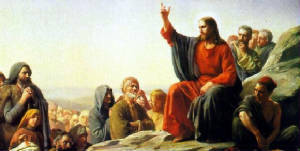 During his (approximate) Three years of ministry, Jesus preached lessons of patience, loving your enemy as well as your neighbors, how to pray to the Lord (The Lords Prayer), who are blessed in the eyes of the Lord (the Beatitudes), and unconditional, selfless service of God and for all people. Selflessness was a main theme of Jesus' messages. Jesus was often in the company of society's undesirable people, giving them hope and forgiving their sins. The messages of Christ varied from "I did not come to judge the world, but to save it." (John 12:47) to "Do not think that I have come to bring peace." The love of Jesus Christ was unconditional, and for all mankind. Near the end of his ministry, he began to tell his apostles of his impending death. The Gospels tell of how Jesus not only predicted his death, but also the betrayal of one of his Apostles, and another one denying him three times. All three of these predictions would prove to come true. Jesus entered Jerusalem triumphantly with people screaming his praises. Later he over turned tables of money changers in Harold's Temple saying they made it a "den of robbers". Later that week Jesus enjoyed a passover feast with his apostles. This dinner would become known as "The Last Supper". During this meal, Jesus took bread and broke it saying "Take this, all of you, and eat it, for this is my body, which will be given up for you." Then he took wine and said "Take this all of you, and drink it, for this is my blood. The blood of a new and everlasting covenant. Do this in remembrance of me." After supper, Jesus washed the Apostle's feet in a humble gesture and told to do the same for others. They then went to pray in a garden. While praying, Jesus was arrested by temple guards. The arrest took place at night to avoid riots by Jesus' many followers. At the peak of his ministry, Jesus had thousands of people attending his messages. It was Judas Iscariot who betrayed Jesus by identifying him to guards with a kiss on the cheek. Later Judas felt so guilty that he tried to give the money back to the guards, who would not take it. He committed suicide after Jesus' death. During Jesus' capture, Simon Peter, one of his Apostles attacked one of the guards with a sword, slicing off his ear. Jesus instantly healed it and rebuked his apostle saying "All they that take the sword shall perish by the sword." During his trial, elders and priests asked Jesus if he was the King of the Jews and Son of God. He said he was and was found guilty of blasphemy. Pontius Pilate, the Roman Procurator, felt that Jesus did nothing wrong against the Romans and, as recorded in the Gospels, had the right to set one prisoner free during passover. He gave the crowd the choice between Jesus and Barbbas, a murderer. The crowd chose to free Barbbas, and Jesus was sentenced to be crucified. Jesus was forced to carry his own cross up to Calvary Hill where he was crucified and died in late afternoon. Three days after his crucifixion, Jesus rose from the dead. the Gospels tell it differently, but all say that Mary Magdeline was the first to find Jesus risen. Ready to accept CHRIST as your personal Savior and get off the road of SIN? Click here! 27 But to you who are willing to listen, I say, love your enemies! Do good to those who hate you. 28 Bless those who curse you. Pray for those who hurt you. 29 If someone slaps you on one cheek, offer the other cheek also. If someone demands your coat, offer your shirt also. 30 Give to anyone who asks; and when things are taken away from you, don't try to get them back. 31 Do to others as you would like them to do to you. 32 If you love only those who love you, why should you get credit for that? Even sinners love those who love them! 33 And if you do good only to those who do good to you, why should you get credit? Even sinners do that much! 34 And if you lend money only to those who can repay you, why should you get credit? Even sinners will lend to other sinners for a full return. 35 Love your enemies! Do good to them. Lend to them without expecting to be repaid. Then your reward from heaven will be very great, and you will truly be acting as children of the Most High, for he is kind to those who are unthankful and wicked. 36 You must be compassionate, just as your Father is compassionate. 37 Do not judge others, and you will not be judged. Do not condemn others, or it will all come back against you. Forgive others, and you will be forgiven. 38 Give, and you will receive. Your gift will return to you in full pressed down, shaken together to make room for more, running over, and poured into your lap. The amount you give will determine the amount you get back." Above is, by some, considered to be one of the greatest messages of Jesus Christ. It is a great outline of what a true Christian should be. Below, you will get to read some of the facts of who Jesus was, where he came from, and what happened to him. Prepare to know Jesus Christ. After reading this, if you decide that Jesus is right for you, you may want to visit the "Sinners Prayer" page next.